Popcorn is one of my all time favorite snacks. The whole family greatly enjoys it, so when our 2 gallon traditional 3-way popcorn tin arrived from The Big Popper, the whole household was super excited. Movie nights are so much better with a huge container of popcorn in the mix. The Big Popper has some of the most delicious gourmet popcorn I've ever eaten. Tristen devoured the butter, Ashley the cheese popcorn, and Dan and I tried to share the caramel. All three flavors were excellent. The tin contained nicely flavored, big pieces of popcorn. This company does not skimp on quality. If you are thinking of sending popcorn gifts this holiday season, I would highly recommend The Big Popper. The quality is fantastic and the prices reasonable. 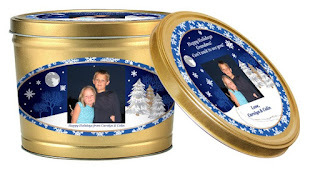 They have three adorable tins available for the holidays. Two of these cute designs can be personalized with your own greetings and pictures. A personalized popcorn tin would make a great gift! 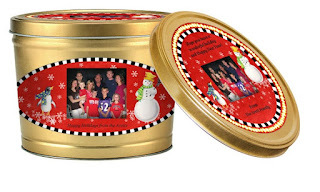 Would you like a 2 gallon traditional 3-way popcorn tin for yourself? All you have to do to win is visit The Big Popper, then come back here and tell me your favorite popcorn flavor. This is mandatory for entry! Be sure to leave a separate comment for each thing you do. Also be sure to leave your email address so I can contact you if you win! This giveaway is open to US residents only. Deadline to enter is Friday 11/20/09 at 11:59pm CST. Good luck! my fave flavor is white cheddar. We like white cheddar the best, but the ozark mix at their site sounds interesting, I checked out the mix of flavors, but I won't tell, so everyone will have to go and find out for themselves. I used the Google Account Identity method you have on your site to enter this. Extra entry #1 I subscribe via email. Extra entry #2 I follow on Google Friend's Connect and my picture there has part of a rainbow in it. I really love Caramel Popcorn. Thanks so much. cashew caramel popcorn sounds delicious! I'd love a tin of white cheddar. Thanks for the giveaway. Wow, hard to choose one flavor! I would have to say i want to try the Cashew Caramel most though, thanks! I love the Gourmet White Cheddar. My favorite flavor of popcorn is caramel. I see The Big Popper has cashew caramel-even better!. Thanks for the chance! My favorite would definitely be the jalapeno since I love hot stuff. Cashew Caramel would be my favorite flavor. The chocolate drizzle sounds so yummy! I think white cheddar sounds good! I'd love to try the Cashew Caramel! My favorite popcorn flavor is cashew caramel. Yum! I follow your blog (Jen V) on google friend connect. I know that caramel has always been a favorite, but would like to try that cashew caramel that they have! My favorite is the buttered popcorn. My favorite flavor of popcorn is Caramel!! Chocolate Drizzle would be my pick. Yum-o! White cheddar sounds yummy!! Thanks for the chance. We prefer carmel corn flavor with cheese flavor a close second. My favorite popcorn flavor is kettle corn! I love the Cashew Caramel flavor popcorn. Thanks for this offer. White Cheddar. Mmmm.... Thank you for the chance to win. my favorite popcorn flavor is yellow cheddar! The Cashew Caramel Popcorn sounds delicious! My favorite popcorn flavor is caramel! My favorite flavor is the White Cheddar Popcorn. i love plain old butter! and the caramel! My favorite is buttered popcorn. I like it the "old fashioned way". MMM I can almost taste it! My favorite popcorn flavor is white cheddar. Yum! Our fav is Yellow Cheddar! Thanks for the contest! My fav is Yellow Cheddar Popcorn. Cheese popcorn is my favorite. Thanks! Either Kettle Corn or Cashew Caramel. 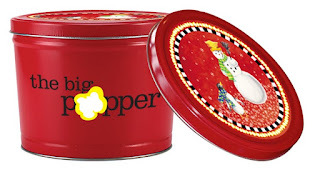 My favorite flavor popcorn from Big Popper is "White Cheddar"
I would love to try the White Cheddar, thanks! The Chocolate Covered Popcorn looks great. My favorite flavor would be the Chocolate Drizzle. Caramel is my favorite flavor. Thanks for the giveaway. I would love to try the Cinnamon flavor! Cashew caramel is my fav! The Ozark mix sounds terrific! Your Holiday Gift Guide button is on my sidebar. My favorite is White Cheddar. Here's another white cheddar fan. I love cheese popcorn so Im guessing I would love the white cheddar! I am another White Cheddar Fan.So So Good! The Almond Pecan sounds amazing!!!! Thanks! The Caramel Popcorn sounds yummy!! Caramel for me, jalapeno for him and we fight over the white cheddar...delicious and nutritious. Great giveaway. Yummmmmmm.Thanks. The jalapeno flavor sounds good. Caramel would be my favorite.